This week, after more than 30 years, a United Nations supported tribunal began the trial of the three highest ranking surviving leaders of the Khmer Rouge–the Communist government responsible for Cambodia’s notorious killing fields in which some 2 to 3 million Cambodian men, women and children were systematically slaughtered between 1975 and 1979. If there was a more internecine government in power during the past 30 years I have yet to see it. I was in Cambodia in 1975 when Khmer Rouge guerillas were attempting to overthrow the U.S.-backed government of President Lon Nol. I watched as they indiscriminately bombarded refugee camps with 107mm Chinese rockets and attacked villages and killed anything that moved. I was evacuated from Phnom Penh in March 1975 and made my way to Vietnam to cover the end of the war there. I made several trips to the Thai-Cambodian border between 1975 and 1979–the year the rapacious Khmer Rouge government was ousted by a Vietnamese invasion. During those trips I heard one horror story after another from Cambodians who had managed to escape the Killing Fields of their homeland. Eventually, more than a million Cambodians filled the squalid camps along the Thai-Cambodian border. Cambodian refugees that I personally interviewed told me of rice paddies being fertilized with the bones and blood of butchered relatives and friends. They spoke of Christian churches and Buddhist temples being turned into torture chambers; of seeing children being roasted over Khmer Rouge fires; of still beating hearts being ripped from the breasts of enemies; of cities emptied of people and streets littered with bones. As I prepared to write this blog on the trial of former Khmer Rouge leaders I went back into my files and found one woman’s story that became all too familiar in the late 1970s. “A few refugees are apprehensive about entering the Thai camp (Khao I-Dang): they have heard that those who enter never come out again. Trust in authority does not come easy for a people betrayed so often by governments. Indeed, Muong Sokhuntherry, a 27-year-old woman with haunting black eyes and a voice soft as velvet, is living proof of that betrayal. “She is the last surviving member of a family of 20. In the past four years she has seen her husband, a former schoolteacher, executed; her mother, father, brothers and sisters clubbed to death in a rice paddy; and her three children–8, 7 and 2, die of starvation. “A former typist in a small office in Phnom Penh, Muong was, like millions of other Cambodians, driven out of the capital after the Khmer Rouge takeover. Following a grueling two-week walk through the jungles to Ta Koe province west of Phnom Penh, Muong and thousands of others became slave laborers, forced to work as many as 18 hours a day constructing dikes and irrigation ditches for rice paddies. This will no doubt be an example of the kind of testimony the tribunal will hear during the next several weeks. Don’t expect any redeeming statements from any of the victims who are called to testify. 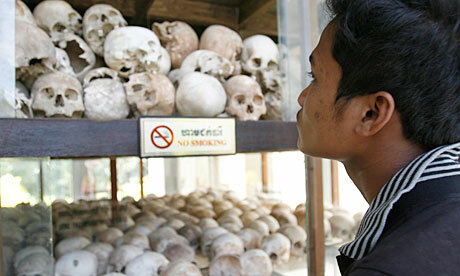 The Khmer Rouge government will, and should be, roundly condemned for the ugly, murderous regime that it was. For four years a nine-member Khmer Rouge junta headed by Pol Pot and calling itself the “Organization on High” ruled Cambodia with a brutality unseen since the holocaust in Europe. Pol Pot, the nation’s so called “supreme leader” and one of the architects of a policy to return Cambodia to the middle ages, died in a jungle camp in 1998 after his former comrades turned on him. But four others from the nine member group survived. 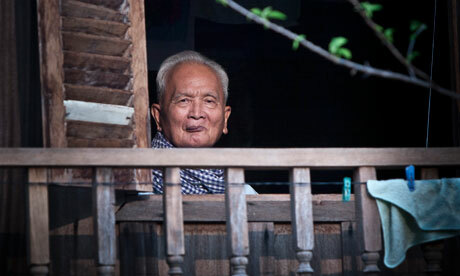 Three of them (85-year-old Nuon Chea, the Khmer Rouge’s chief ideologist and No. 2 leader; 80-year-old Khieu Samphan, an ex-head of state; and 86-year-old former foreign minister Ieng Sary, went on trial this week in Phnom Penh. A fourth, 79-year-old Ieng Thirith, was ruled unfit to stand trial last week because she has Alzheimer’s disease. She is Ieng Sary’s wife and was the regime’s minister for social affairs. Some may wonder why, at this late date, the government is putting these aging Communists on trial. A quick look at the brutal Khmer Rouge regime that claimed the lives of an estimated 2.5 million people provides an answer. Under Marxist leader Pol Pot, the Khmer Rouge tried to take Cambodia back to a pre-industrial age, forcing millions of people from the cities to work on communal farms in the countryside. But this dramatic attempt at social engineering had a terrible cost, and whole families died from execution, starvation, disease and overwork. Before Pol Pot took power in 1975 he and his Khmer Rouge henchmen lived in the country’s remote north-east. There they were influenced by the surrounding hill tribes, who were self-sufficient in their communal living, had no use for money and were “untainted” by Buddhism. When he came to power, he and his ruling clique quickly set about transforming Cambodia – now re-named Kampuchea – into what they hoped would be an agrarian utopia. Anyone thought to be an intellectual of any sort was killed. Often people were condemned to death for wearing glasses or knowing a foreign language. Tens of thousands of the educated middle-classes were tortured and executed in special centers. The most notorious of these centers was the S-21 jail in Phnom Penh, where more than 17,000 men, women and children were imprisoned during the regime’s four years in power. The Khmer Rouge government was finally overthrown in 1979 by invading Vietnamese troops, after a series of violent border confrontations. The Khmer Rouge leadership retreated to remote areas of the country, where they remained active for a while but gradually became less and less powerful. Survivors told their stories to shocked audiences, and in the 1980s the Hollywood movie “The Killing Fields” brought the plight of the Khmer Rouge victims to worldwide attention. Pol Pot was denounced by his former comrades in a show trial in July 1997, and sentenced to house arrest in his jungle home. But less than a year later he was dead – denying the millions of people who were affected by this brutal regime the chance to bring him to justice. Now the remaining Khmer Rouge hierarchy is finally on trial and the first of the men to appear was the party’s former ideologue, Nuon Chea, who opened his defense against a charge of genocide. He said that the Khmer Rouge revolution in the 1970s was aimed at freeing Cambodia from colonialism and protecting it from invasion by Vietnam. His testimony marked the first time a leader of the Khmer Rouge has defended the motives of the ultra-communist regime. International co-prosecutor Andrew Cayley told the tribunal it should not be tempted by feelings of compassion for the elderly and infirm defendants in their 80s who had “murdered, tortured and terrorized” their own people. Cambodian people who managed to survive the destructive rule of the Khmer Rouge. I plan to follow this trial and will keep you posted.